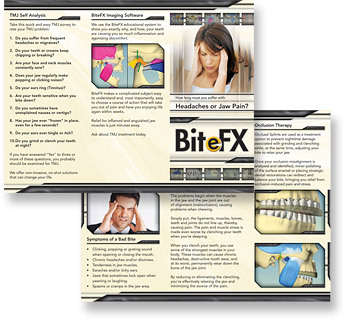 As part of the BiteFX Platinum Insider's Circle each month you will receive a marketing piece that you can use to help promote your practice. 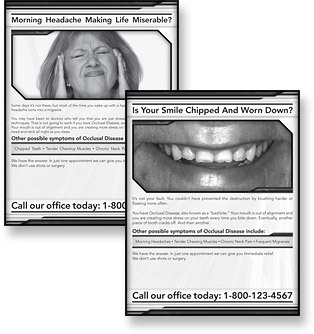 These are produced by Curtis Group, a marketing consultancy that specializes in dental practice marketing. Multi-media: brochures, print ads, videos (for use on your website), radio ads, event guides, … Give yourself a complete set of occlusion-focused marketing materials! BiteFX has been an amazing addition to our consultation experience! Our patients, both new and existing, have given rave reviews.